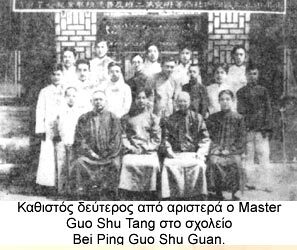 Master Guo Cheng Yao (or Shu Tang) was born in Baiquan district of the Heilongjiang Province and was one of the major students of Master Cheng Zi Zheng . 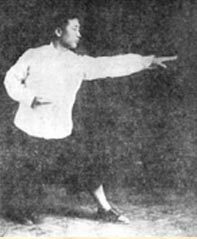 Guo started his study in the Eagle Claw style in 1915 in the 1st High school of Heilongjiang Province where Chen Zi Zeng was teaching Wushu. His obstinacy and thirst for knowledge convinced the great Master to accept him as a personal student, and pass all his knowledge down to him. Since childhood Guo Cheng Yao had a natural defect with his right foot due to which he had trouble in walking. In order to overcome his problem and aquire balance and ease at footwork, he exercised his techniques on the surface of a frozen lake. In addition to that Master Chen used to strike Guo's right leg during practice, at every opportunity, thus compelling him to defend himself with it and use it more efficiently than the left one. Right after his graduation Guo took over the teaching of Wushu in the district's High school. Three years later he returned to his birthplace along with You Shu Kong (also a student of Chen Zi Zeng with the intention of perfecting their technique. In 1925 he travelled to the Capital of the country in order to teach Eagle Claw Kung Fu at the (then) famous Bei Ping Guo Shu Guan school of martial arts, while later he was appointed head of the 2nd Beijing Wushu team. 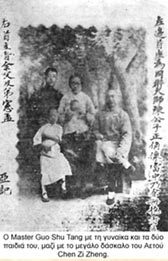 In 1928 on the qualifying round for athletes to represent Beijing at the Chinese Wushu Championship, Guo and teacher Wan Laisheng (natural style) were nominated as winners. After that Guo won all the fights he fought at the Championship, the most exciting being the one against the champion of the Jiang Su province. The fight lasted half an hour, during which, Guo managed to hit his opponent 8 times. At the end of the fight his opponent couldn't stand on his own feet. That particular victory gave Guo great fame in all northern China. The power of his grip was enormous, while even a 1000kg wagon could cross over his forearm without causing him the slightest damage. Besides his competency in fighting with bare hands, teacher Guo was also excellent in fighting with the sword (jian). In a single combat against a famous sword-fighter from Shanghai named "King of the Sword" , for whom it was said that he was as fast as ightning, Guo pulled away the opponent's sword three times. Along with his teachers You Shou Kong, Wang Bing Zhen, Qu Ji Xing and Guo Rui Ji, Guo wrote and published a book named "Guide to the Eagle Claw Style" . In this book Guo presented his personal point of view on Nei Gong (internal exercise) and Wai Gong (external exercise). Showing a great open mindedness he also practised Tai Ji, Ba Qua and Tong Bei in order to improve his ability in martial arts. Later on, along with You Shu Kong, they created Yue Shi Ba Fan Zhang, a fighting style which contains the strongest elements of the Eagle Claw combined with the afore mentioned styles. He also created Long Quan (dragon's fist) and the "Ways of the Sword", Duan Hong Jian (cutting the rainbow) and Jin Ri Jian (The sword against the Japanese) both including effective movements and imposing techniques. A capable keeper of the Eagle Claw tradition, unfortunately this great teacher died at a rather young age, in July 1941. He taught many students and passed all his knowledge down to his eldest son, Guo Xian Ya , eldest brother of our respected teacher Guo Xian He .